The 2018 TORO New Zealand Speedgolf Open produced one of the closest finishes this format has seen at the Windross Farm Golf Club on the weekend of 24-25 February. Former Taranaki representative Jamie Reid won his first national title by just 21 seconds over NZ PGA professional Josh Longney, illustrating just how important it is to put a good golf score together while running at a quick pace, while Susan Farron took out the women’s title. Reid started the final day in third place, 10 seconds behind Longney and one minute and 23 seconds behind overnight leader American world number two, Wes Cupp. Reid continued his consistent golf with a repeat score of 77 but his run time of 45 minutes and 25 seconds was the fastest of the day and proved to be the difference in catching and passing both Longney and Cupp. The format combines gross score plus the time to play and the Windross Farm course proved to be an ideal venue. During the two days the lead changed regularly with the top three finishing within a total of three points, with golf scores and running times very similar. Reid’s two rounds of 77 averaged just under 46 minutes, Longney scored 78, 77 with the fastest total running time of 91 minutes and four seconds, whilst Cupp returned 76,79 averaging just under 47 minutes per round. Susan Farron, the former President of the NZ PGA, was a very welcome entry to the championship. A former tour player and now marathon runner, Farron was competing in her first Speedgolf tournament. With scores of 79 and 78, completed in 56 and 57 minutes, this was good enough to win the women’s championship by five points over visiting American and US Speedgolf champion, Lauren Cupp. Australian Jared Dries won the under 20 age group division with 81,79 averaging 48 minutes for each round. Reid, Longney & Cupp were the best of the 20-39 age bracket. Troy Harold, who is new to Speedgolf, ran impressively recording the quickest 18-hole run of 45 minutes six seconds when scoring 84, which be backed up with a 47-minute run for a very impressive 78. Harold was a comfortable winner of the 40-49 age bracket. Phil Aickin, both competitor and tournament director for the weekend, scored 75, 77 averaging 59 minutes to win the over 50 division. Former professional and 2004 New Zealand Open runner up, Brad Heaven, recorded two rounds of 75, using just 4 golf clubs, but illustrated that he is a talented runner completing each round in 50 and 51 minutes. Auckland based NZ PGA professional Blake Cowley returned two rounds of 80 and each time running under 50 minutes. 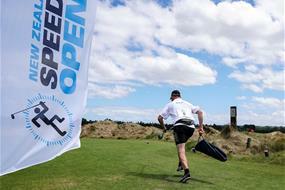 Thirty-nine enthusiastic speedgolfers started the competition, which featured three Americans, four Australians, six women and four professional golfers. The supportive and family atmosphere is something rarely seen golf events with music playing and a finish line in front of the clubhouse to welcome tired players home.